THANKS TO ALL OF THE PARTICIPANTS AND PATRONS WHO SUPPORTED OUR 45TH SEASON. DSP IS WORKING ON OUR SEASON’S DETAILS WHICH WE AIM TO ANNOUNCE IN LATE JUNE. 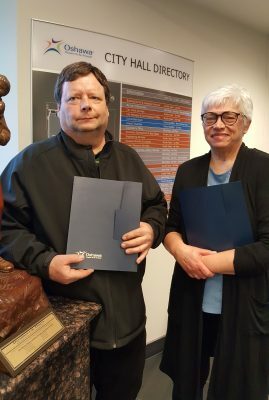 On April 8, Oshawa City Council honoured long time set builder, Joel Tomlinson, and stage manager, Christy Chase, with 2019 Volunteer Recognition Awards. Something to celebrate – 153 productions in downtown Oshawa, 101 of them Canadian, 34 of them by local writers. Since 1974, DSP’s non-profit objectives have been all about quality and accessibility: to present challenging and entertaining plays with an emphasis on innovative directing and design, and to keep production costs low so that live theatre can be enjoyed by all members of the community. Our shows are always chosen by the director so there’s passion for the piece right from the beginning, and auditions are always low-threat and open to all. Attend DSP events on the second floor of the Arts Resource Centre, 45 Queen St., Oshawa, and is fully accessible by modern elevator indoors and by ramp outside. The theatre space is an intimate, air-conditioned 100 seat venue with no seat farther than 8 metres from the action! Plentiful parking is free after 6 pm. If the lot closest to the building is full, there’s more parking on the south side of the Robert McLaughlin Gallery. Occasionally there is some congestion on weeknights if City Hall, the Library and the Arts Resource Centre are all holding events simultaneously, but we love when downtown is full of cultural activity.